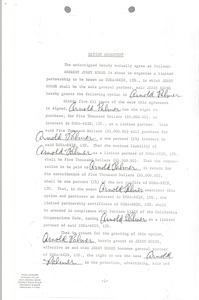 Los Angeles (Calif.) - Option agreement between Jerry Horne, sole general partner of Dura-Skin Ltd., and Arnold Palmer. 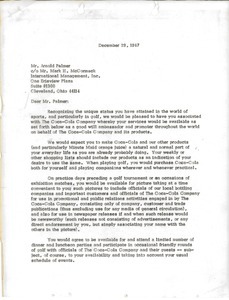 Cleveland (Ohio) - Proposed letter agreement drawn up by Mark H. McCormack between Arnold Palmer and Coca-Cola Company, based on a similar agreement with Jack Nicklaus. It outlines Palmer's proposed role as ambassador and promoter of Coca-Cola products, what is expected of him and how he will be compensated. 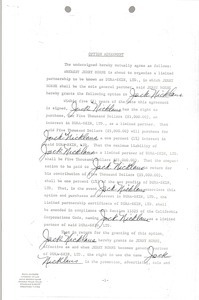 Los Angeles (Calif.) - Option agreement between Jerry Horne, sole general partner of Dura-Skin Ltd., and Jack Nicklaus.